West Virginia University's setback to Oklahoma State prevented the Mountaineers from likely making a significant jump in the recently released Associated Press men's basketball poll. 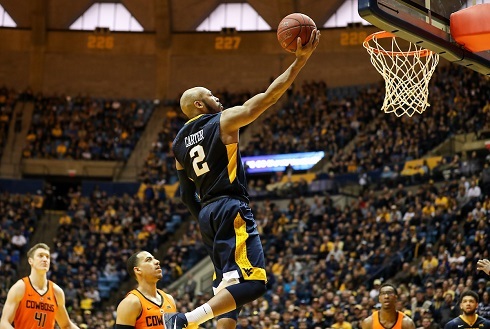 Instead, the Mountaineers fell despite getting a win at Oklahoma last Monday. WVU was the first team this year to beat the Sooners in Norman. However, the setback to the Cowboys at home resulted in the team dropping from No. 19 to No. 20 this week. Virginia is the nation's new top-ranked team. WVU will play at home tonight against Texas Christian University at 9 p.m. TCU toppled WVU earlier this season. Click HERE to see the entire top 25 from Bleacher Report. Click link below to see a photo gallery from the WVU game by Ben Queen of www.benqueenphotography.com. Editor's Note: Photo shows Jevon Carter driving for two of his career-high 33 points against Oklahoma State Saturday in Morgantonw.